last weekend around 1 am i found myself on main street enraptured with the late night food choices in midtown. the plan: tacos a go-go for tacos to go to pair with continental club margaritas. tacos a go go was hopping busy. S. and i ordered a pollo guisada, grilled fish, and bacon egg & cheese taco. we found an empty booth and then i decided we needed some frito pie too. 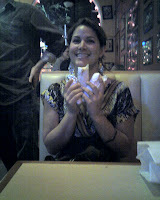 we scarfed down our tacos while waiting for the "pie." the tortillas were soft and warm and the eggs hot and fluffy. i looked up from our food and see some of my guy friends hovering above us. 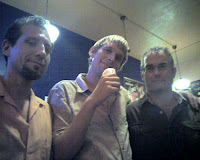 i make a drunken promise to post their photo on my blog this week then excuse ourselves, pick up the FP, and walk next door talking the door guy at continental into letting us in for free although there was a cover that night. with margaritas in hand, we find an empty place to sit in the back room passing by the barbeque guy! mmm brisket! (suddenly the frito pie isn't that exciting anymore.) bbq guy's name is adam fisher, who is brothers with bill fisher of kozy kitchen - yes the same kozy kitchen that lost every round of the bbq smackdown. granted i've never had adam's bbq sober, but i always remember it being better than what we picked up from kozy. i order a brisket sandwich chalking it up to investigative journalism. the meats are kept warm in the largest slow cooker i've ever seen. adam cuts each brisket to order. tender smokey meat, just enough fat, delish! 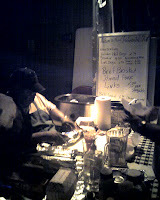 adam was also serving links and boudin that night. before signing out, i must mention reef's 3rd bar on travis which is open late thu-sat. i think they are suppose to be open until 2 or 3, but when we drove by at 2 the lights were already out. super fabulous food and specialty cocktails. try the juicy beef sliders which are awesome and fries with sriracha mayo. snapper carpaccio is also uber fresh and memorable. although it's harder catching a glimpse of hottie chef bryan caswell, the bar is quieter and more intimate than the main dining room which closes at 11 anyway. caswell recently tried out for top chef in new orleans. wouldn't he make a great contestant? not only is he talented, he seems like a really nice guy and isn't too hard on the eyes either.